Cruel and unusual punishment is a platitude found in the Eighth Amendment to the U.S. Constitution. 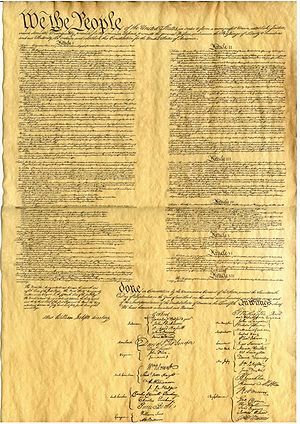 The Amendment, like the rest of the Bill of Rights, was written to ensure that the new American nation would not suffer from the excesses of the former English overlords, such as drawing-and-quartering, death by torture (no matter how entertaining it was to contemplate it being done to Mel Gibson in Braveheart), or repeats of Mr. Bean. That the Founding Founders in the execution-happy colonies would have written an amendment to ban executions entirely is so unthinkable that it has taken the finest minds in the United States to explain why it means exactly this. Most uses of the Eighth Amendment in the U.S. court system therefore concern executions, the exception being the rare lawsuit to demand premium cable channels on prison televisions. The Eighth Amendment prevents reruns of the original Star Trek from being broadcast in most of the United States — necessitating the "re-launch." In fact, no prisoner has ever been drawn-and-quartered or tortured in the United States at all. And slavery, the Alternative Minimum Tax, and Instant Replay in Major League Baseball are technically not even "punishments." The Supreme Court, then, has had the task of understanding what the Founders could have meant by writing an Amendment that, on the surface, seems meaningless. In the American renaissance called the Great Society, it first occurred to the Court that the death penalty itself could be "cruel and unusual punishment." Authors of gun massacres, because this is the fault of gun shows, SUVs, and rodeos. Eventually, the Court banned executions entirely. Then unbanned them, subject to a brand new list of niceties. In the modern United States, executions are almost unheard-of, except in Texas. The Court has held that all punishments must be pleasant to the person being punished, and that it is "cruel and unusual" to have a shortage of government lawyers to ensure that everything keeps your Senator looking like a nice guy. World Cup draw claimed "cruel and unusual"
Texas thrived during the years that the rest of the nation stagnated, the result of the boom in contract executions (and to a lesser extent, of drilling for oil). Other states sent their prisoners to Texas where, like jihadists at Guantanamo or the burning coal that makes the electricity for your Prius, we can happily assume it doesn't happen if we can't see it. However, even in Texas, execution has to be done "humanely," even though barbecue does not have to be. Gone are the days of firing squads, which look too much like government taking life by force. Prisoners are now strapped to a guernsey and put to death by "care-givers," usually trained doctors and nurses with bright smiles, a smooth bedside manner, and white lab coats. They administer lethal injections in an atmosphere of total compassion. The chemicals are tested to ensure that they are both safe and effective, and in almost all cases, they safely kill the recipient. Political debates are a remaining cruel and unusual punishment. Saddam Hussein. Following the War in Iraq, George W. Bush barred Saddam from joining a coalition government, retiring to Paraguay, or moving to Vermont and starting a blog, as most war criminals do. Saddam was not even offered a government consulting contract. Instead, he was tried and found guilty of capital vanity. Unfortunately, although Western technical advisers had given Iraq plenty of brass fixtures and powdered wigs, there were few qualified hangmen. Thus, Saddam was not just hanged but decapitated; worse yet, YouTube had not been invented so that youthful rioters could be whipped into a frenzy, storm a foreign consulate, and kill an ambassador or two. Most of these imperfections were solved, and just in time for another Iraqi government to fall. In 2014, there was a series of botched executions. In one notorious case in Texas, the "cocktail" of injections — to kill the prisoner, but first numb him up, but first relax him so that being numbed up is not really scary — failed. The prisoner gasped for air, then repeatedly mumbled, "I'm going to die!" — to which witnesses in the room simply looked at one another and nodded. An arduous half-hour later, he was executed by heart attack, which was flatly in violation of all the planning documents, and would have required additional permits and environmental review. Despite the tradition of multiple marksmen in a firing squad, so that no one could ever know who actually fired the lethal bullet, it is always clear which rich pharmaceutical company sold the state the lethal cocktail, and one thing that can never be put to death is the slip-and-fall bar. Thus the death sentence for drugmakers is slow and not painless. As his last act as Texas Governor, Rick Perry, who showed in 2012 that he is no stranger to pharmacology, prepended himself to the execution "cocktail," giving those on Death Row his stock campaign speech before their first injection, to make them want to die. This page was last edited on 2 October 2015, at 21:26.